Oh great, another article to join the internet about job searching tips. However, I can guarantee you'll learn something new from this one. And the title has a swear word in it *gasp*...so this should be fun. 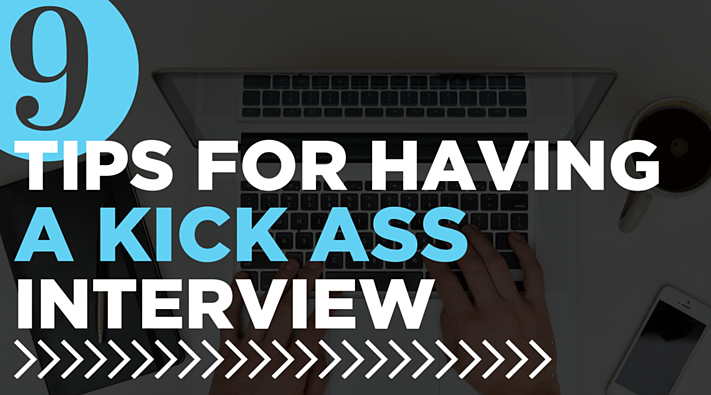 Read on for 9 tips that could help you out in your next interview. Don't fluff up your answers if you don't know something. Trust me, we know when you're stretching it. If you really don't know something, it's okay to say "I don't know". We'd rather that than listen to you work your way around into an answer that doesn't really relate to the question asked in the first place. Instead, be honest, tell them you'll be interested to find out more after the interview, and tell them any background knowledge you do have from the question asked. The best thing you can do for you and your future employer is to be yourself and show them the person they are going to be working with. Many say that culture fit is one of the biggest factors when it comes to hiring and firing, and in our case this is absolutely true. If someone has the best skills and the most extensive experience––none of that matters if you aren't going to be a good fit with the team. Interviewing may be a nerve wracking thing but smiling and staying true to yourself goes a long way. We'll tell you this time and time again, but really do your homework. The employer already expects that you are walking in with the knowledge of the company and what they do. For example, our agency is built on the principles of inbound marketing so I can guarantee you we will always ask a question such as "So what do you know about inbound marketing?" There will always be a time at the end for the employer to turn the interview around and say "So do you have any questions for us?" The answer should never be "none that I can think of." Always have some questions prepared for the interviewer and try and think of some as the interview progresses to draw from what the employer is saying. Such as "you mentioned your company does xyz, can you tell me more about that?" Coming prepared with questions is one thing, but showing you're listening and engaging is even better. Questions you shouldn't ask in your first interview are things like "how much vacation will I get" "what is the pay like" "how many sick days can I take" etc. While these may be important to know, focusing on these (especially in a first interview) may come across that the you are only looking for a place to get awesome perks and not as inspired by the job itself. Don't assume you're a qualified candidate. Don't assume you're going to get the job. Don't assume the interviewer has looked at your resume. Just because you have more experience than most candidates, doesn't mean you're qualified. Just because you have an "in" at the company or you've made it to interview #4, doesn't mean you're going to get the job. And you never know if the interviewer may have been pulled in last minute and knows nothing about you. So you did your networking and now you locked down an interview. Going the extra mile is looking up the potential interviewers and employees of the company and follow them across social. This will help you get a really good sense of the company culture and the personalities of the team. This is also a great opportunity for you to reach out to them, explain you will be interviewing soon and how excited you are. Even if the people you interact with aren't making the hiring decision, it can still make a huge impact! Almost every interview will start off with a very general, open question such as "tell me about yourself." This is your time. It is completely open ended and giving you the floor. Don't waste this time by explaining your qualifications, what you majored in college, and how many internships you've had. Instead, use this time to stand out and make a memorable impression with an awesome story. Maybe it's about how you grew up and developed your passions. Don't bore the interviewer by reciting the facts on your resumé. You are not only in an interview to inform but also to entertain and show your personality. Remember, the question is "tell me about yourself" and not "so what makes you a qualified candidate?" There's a difference. While so far in this post, if you walked away with the first 7 you'd be in pretty good shape. Though, I'd argue that "Be Helpful" is one of the most important tips on this list. Whether you're networking, in a job interview, or 3 months into your new job––always be helpful to others. How can you be helpful to this company? Where and how are you going to provide value? Before you ask for something from someone, ask how you can help them first. In an interview, we're not here to listen about why this would be a great opportunity for you, we want to see your excitement for helping the company and how you can provide value. Very small, logistical thing, but very important. Don't be late should be a no brainer––but have you ever heard someone tell you don't be early? Yes this is a thing. Especially at an agency with jam packed days with many moving parts––even coming 10 minutes early could cause an inconvenience for someone working there and disrupt their work flow. Best thing to do is to arrive early, but wait in your car until no more than 5 minutes before your time slot to enter the building. So there you have it. 9 tidbits of advice from someone who has witnessed outstanding interviews all the way to complete disasters. I have seen people unqualify themselves within 2 minutes of walking in the door, and I've seen people unqualify themselves after 5 awesome interviews. While it's true that every employer is going to be different and may value different aspects of your interview, I can tell you what I know and what works. You can read all the articles on the internet with job interview tips (like this one), study all the questions you might be asked, dot your i's and cross your t's––but in the end, it's all about being the right fit. Probably not what you wanted to hear (sorry). However, you're on the right track for setting yourself up for success. :) Comment below or message me if you have any job searching questions! Hüify is hiring! Click below to apply online now.